"That. Hurt. Stand up. Hurts. Ugh. Stand. Up." All the glitz and glamour that comes with making an astounding historical find is typically hard-earned. As any adventurous archaeologist will tell you, getting the prized artifact doesn't come easy. Lara Croft has certainly faced her share of danger en route to some pretty amazing adventures, yet that doesn't stop Dark Horse Comics from throwing more danger her way in Tomb Raider #1. The issue is written by Mariko Tamaki, illustrated by Phillip Sevy, colored by Michael Atiyeh and lettered by Michael Heisler. 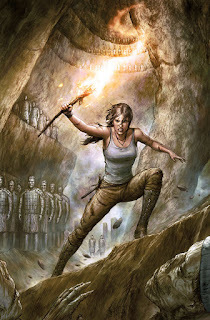 Tomb Raider #1 opens up much like any other Tomb Raider story with Lara Croft exploring, training and being approached about her archaeological expertise. From there though, Tamaki makes things a bit more interesting. Lara doesn't readily accept the notion of assisting with a hunt for immortality--it's not until a series of strange events unfold that her interest is piqued. Tamaki presents this series of events very elegantly, moving Lara through situations that each represent a different facet of her personality. It's a well-executed, subtle way for Tamaki to introduce new readers to Lara Croft while providing enough hooks that familiar readers will nod along in approval. Unfortunately for Sevy, Tomb Raider #1 doesn't really give him much chance to illustrate exotic locales for Lara to traverse through, but what he does illustrate comes across well. Lara is easily recognizable despite not spending much time in her trademark adventuring garb and Sevy doesn't over-sexualize her gratuitously. The panel layouts are also very interesting, as some pages feel cramped in a way that still manages to cleanly choreograph every punch thrown in a battle while other pages boast circle overlays that give the reader a glimpse into what Lara is experiencing with her senses. The various panel styles keeps the reader on their toes and gives Sevy the opportunity to visually define the different parts of Lara's personality. Atiyeh's colors come across as predominantly muted yet still provide plenty of contrast amongst characters. Tomb Raider #1 successfully blends all the great characteristics of a good Tomb Raider story in a way that's accessible to new readers and welcomed by old readers. Lara Croft is a well-traveled explorer who never seems to be able to completely escape dangerous situations which makes for interesting reading. Tamaki's script builds up to a cliffhanger ending that sets the stage for the remainder of the series. Sevy's illustrations are effective and clean, giving readers a version of Lara Croft who's confident in her demeanor and abilities. Tomb Raider #1 is a great first issue that feels like an extension of the video games the series is based on. Tomb Raider #1 is in stores February 17.